Protect your tech wherever you are! Headquartered in South Florida, we have seen extremely damaging storms in recent years. We provide solutions that can either replicate your server environment to the Cloud, Data center, or migrate your servers and phone systems to the cloud without losing functionality or continuity. Disaster can rear it’s ugly head at anytime, anywhere for literally, any reason. Be safe, take advantage of the knowledge that could have only been attained by real experience. 4 Corner IT has contingency plans for almost any organization. Our expertise has enabled us to stand out in the crowd, offering Disaster Recovery to not only institutions, but small, home offices that desperately need the attention to detail, which only a support staff can possibly provide. As with all of our managed services, Disaster Recovery is available as a stand-alone service, as well as an IT support plan. The flexibility of this allows you to cut your IT support costs without compromising your piece of mind. 4 Corner IT is dedicated to growth and success of your business, understanding your technology is just part of the package. Our responsive team is equipped to handle the most extenuating circumstances, offering you security and reliability where you need it most.The fact is, solutions that were once only available to the enterprise market has just become affordable to the small and medium sized business. 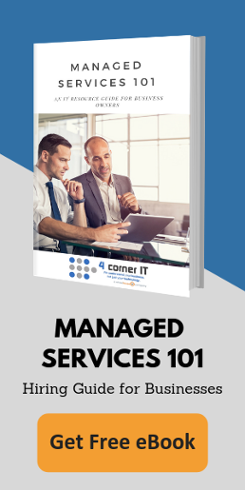 Use our knowledge and resources to your advantage and find out how you can make full use of our managed services – call us today to see how we can assist you!